Played all the available modes: single player, co-op online, co-op splitscreen. Played both levels to completion in the various ways. Beat the “Executioner” and the chainsaw mini boss. 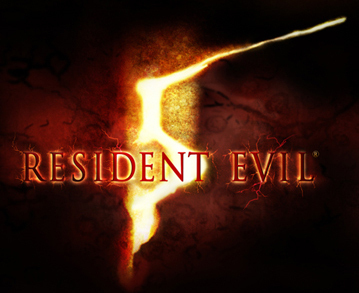 I love Resident Evil 4, I beat the game on “professional” on the Gamecube and loved the challenge, action, and plagas. The Wii version was excellent but was overall easier. I had high hopes for Resident Evil 5 and the demo delivers basically what I wanted. The menu has the announcer from RE4 who announces “Resident Evil Fiiiiiive” and I have to say he seems surprised at the five. The menu has a Metroid Prime feel of celled creatures. There is a leaderboard option that is grayed out and I assume that the final game will be scored based on time, kills, and collectables encouraging repeat play. The US demo has the game controls defaulted to strafing (Control Style D), aka their version of Gears of War. The Japanese demo on the other hand has the controls defaulted to the RE4 controls (A). The controls changed be changed on the fly, so you won’t get stuck trying to find the fire button. The best controls are A and C. I like A the best since it is the same as the RE4 controls. Control style C is the RE4 controls with strafing. I don’t like B and D because they move around the knife and fire buttons and it is not easy to use from my experience. When you start the game, you have the option of “Public Assembly” or “Shanty Town”. Out of the two, I liked Public Assembly better because there is more action and more opportunities to test the game. Shanty Town is more the exploration aspect of Resident Evil 4. Public Assembly starts off with Chris and Sheva entering the town early in the game. They go to a house where they see someone they know being held hostage outside on a scaffolding. The guy with the microphone from the trailers yells at a frenzied crowd who want the man dead. 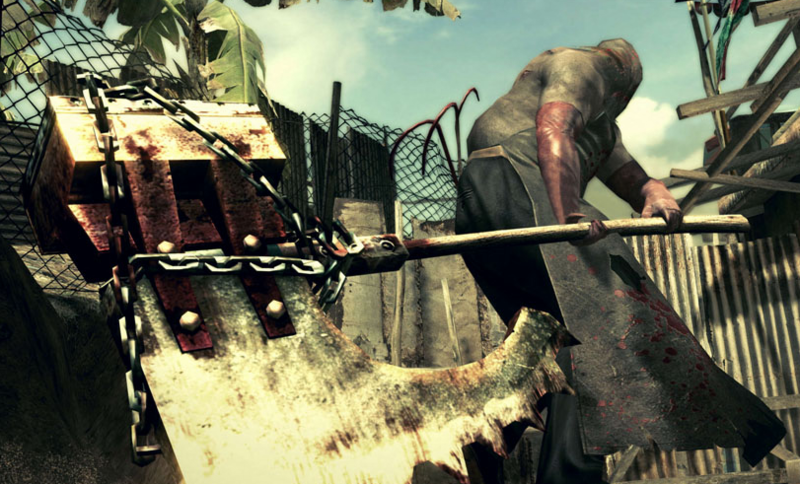 A giant executer with a huge axe type blade approaches and cleaves the hostage’s head off. The microphone guy somehow sees Chris and Sheva in the window and sends his people towards them. This is where the action starts off and it is similar to RE4’s house defense from the plagas. You can explore the room and get supplies from things like cutting/shooting fruit. There are two windows and you can push bookcases in front of them like in the previous game. Me being the awesome player that I am decided that I only need one window covered and I take position by the other. My strategy is the classic one from RE4 where I spam the knife next to the window. By the way, the knife has seen a nice upgrade in horizontal range as Chris is carrying a machete instead of a combat knife. 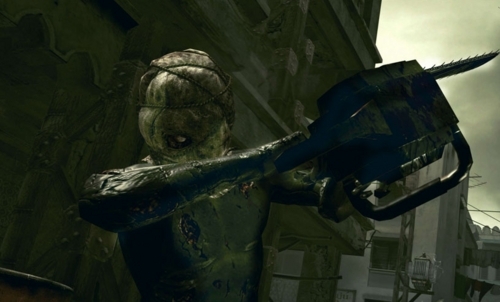 As the enemies come through the window, they still get knocked back out of the window like in RE4. If they somehow make it inside, they fall to my knife. There is also the option to snipe the microphone guy off the platform in the distance and I don’t know if this has any bearing on the amount of enemies that spawn. After I have easily defeated the first onslaught of enemies and shown off Chris’ FALCON PUNCH which he calls a “Straight”, enemies break open the ceiling and come on down. The executioner guy also shows up as his hugeness slowed him down compare to the faster guys. He makes an entrance by destroying a gate and allowing the players to move further into the town. He decided that he wants to show off some axe moves and I am more than happy to run away and let him wipe out a lot of the enemies with his wild swings. On my first playthroughs of the level, I decided not to go after the executioner and just explore. There are a lot more enemies on the screen than in Resident Evil 4 and this is a good for people like me that are good at headshots/knee shots. The headshot is much better than going for the knees in this game because when I go for the knees, the game doesn’t often count it as a knee shot and then I can’t do the action move. The headshot punch move is much cooler looking than the uppercut you can do from shooting the knees. A new, awesome move is the stomp. If the enemy is down and is not dead, Chris has the option to “stomp”. Depending where Chris is in location to the enemy, Chris could stomp on the guys chest, or stomp on their head. The head stomp is pretty sweet looking and effective. Sheva’s action moves are alright. She has a kick, a knife attack, and a flip move. They all pale in comparison to the Straight. If Sheva was a tank and had buffed up muscles, then she could do the awesome things like Chris. She probably has some benefit later on besides being acrobatic. Depending if I am playing online, I spam the communication button (circle) just for flair. I do funny thing like request a green herb just to hear Chris say “I need an herb”. Yes, you do need some “herbs” to recover health Chris. Playing online is a better idea than playing alone as a human player is a lot more efficient than Sheva’s AI. The only downside is that with human players, we tend to split up too much which is very dangerous. If one of the players is critically wounded (health near zero), the other player has to make their way over to them and hit the action button to inject them with magic that keeps them alive. I use the term magic here because if the person keeps getting critical from the executioner’s axe, I can keep injecting them so they can take another blow. Since I am a pro, I only get downed if I am being careless with the mini boss. The villages haven’t been enough of a threat to get my health critical. After a set amount of time, this level ends because your friend Kirk arrives in his helicopter and dishes out the RPG necessary to open the next area. Just like in Resident Evil 4, helicopters are amazingly overpowered and there is probably a 95 percent chance that all helicopters will be shot down during the course of the plot. This of course happens in Shanty Town because the infested bat creatures can somehow bring down a helicopter. The helicopters in game are like paper airplanes, any little scratch and they go down. This wasn’t the case in RE4. The RE4 pilot Mike was awesome. “Names Mike, if you are looking for firepower you have come to the right place” “Getouttatheway, getouttatheway!” “Yeah, wiped 'em clear!” Yes I know these quotes by heart. That was a helicopter pilot who wasn’t afraid to fire on his own personnel to get the job done. Mike was so epic, he used his helicopter to bring down a water tower which somehow exploded taking out tons of Granados. He even earned Leon’s respect, that Leon was going to buy him beer when they got back. Mike the helicopter pilot died from an RPG, not bats (assuming Kirk dies just to make Wesker seem more evil). This minor character in the RE universe is so great, that he has to survive the crash even though Leon pronounced him dead so other video game helicopter pilots can see how it is done. With my RE4 helicopter tangent aside, in Shanty Town, you are basically exploring the town like was done in the early parts of RE4 before it became night. Chainsaws have somehow been introduced to the village as they use it to cut meat/people in houses. Ignoring the fact that chainsaws are not indigenous to Africa, every RE game now needs chainsaws so I can overlook them being out of place. Chris and Sheva collect some supplies from the town area, kill some stray villages and then watch Kirk’s helicopter spin out of control and disappear in the distance. This is where a few villages show up and you throw Sheva up to the second floor for some reason that triggers them. Inside the house, Chris has to throw Sheva to the other side by using his muscles and her acrobatic skill to do a flip for no reason other than its all she has. Nothing against Sheva, but I prefer to control a character with infinite brute force over using a knife to do some action moves. While Sheva is in the other building, Chris can provide cover fire with his sniper even though you can easily aim with the lasersight of the pistol. After Sheva goes downstairs, she can open the door that is blocking Chris. If she and Chris are having relationship issues, she can continue on without him and trigger the chainsaw guy who will then open the door for Chris. This is what happened to me when the online Sheva refused to open the locked door. As soon as the chainsaw guy appears, the level gets much more difficult. Obviously getting hit by the chainsaw is instant death, so I can’t go up there and try my knife skills yet (I did get a few knife hits in, but I was deathly surprised when he quickly turned around and got me without any warning). This area emphasizes using the environment to kill the chainsaw guy since they is limited ammo. So you can use the classic red explosive barrels to do the trick along with an electric capacitor on the roof. Once you get the chainsaw guy to flinch, you can do the classic action button to do more damage. If your partner is nearby, they can do one more action button where the enemy will bounce between them like a pinball. Killing the chainsaw guy gets the key and allows you to reach the end of mission door. The demo was an amazing tidbit of the RE5 game. The mini-bosses were pretty challenging and I can’t wait to see what the full bosses look like. Minor issues with the game was that it liked to freeze if I started out with coop online, finished the mission, and then selected coop online again. It would freeze in the menu between selecting coop online and the server screen. The menu would look very laggy and the screen would dim and get brighter. I had to manually turn off PS3. I was already going to buy this game on day one and the demo has cemented the purchase. I don’t believe in preordering on the principal but if I did, I would have this one pre-ordered a long time ago. I can’t wait until I can play the full game and see how Wesker has yet again caused chaos. He is God afterall in the Resident Evil universe. March can’t come soon enough.